Sore eyes from too much screen time? Pretty common for me and I’m sure I’m not the only one. I swear that if i was to plot the decline of my eyesight alongside my increased use of computers/mobile/laptops there would be a clear correlation. I got my first pair of glasses a few years ago and whilst i’ve resisted using them as much as possible, sometimes my eyes just feel tired and need a bit of help. But the catch for me is that as I don’t wear my glasses all the time I either have to wear them from when I get up in the morning all day OR I have a bit of a ‘adjusting’ time where my eyes get used to wearing them. Sometimes I just don’t have the time or patience for dealing with that bit of blurry/getting used to them phase. Or by the time I reach for them my eyes are already uncomfortable and sore so finding other quick refresh & soothe options are preferable to reaching for the specks. Eye drops have been a regular part of my routine for a while. I used to have them in my drawer in my old job so I could reach for them as the hours ticked on through the day and the screen-staring took it’s toll. It was however a tad awkward to drop them into my eyes and the inevitable eye-watering that followed… I have quite sensitive eyes anyway so the smallest things can make them water like I’m watching a sob-fest movie. So when the new generation of eye drop alternatives launched I was all over it. 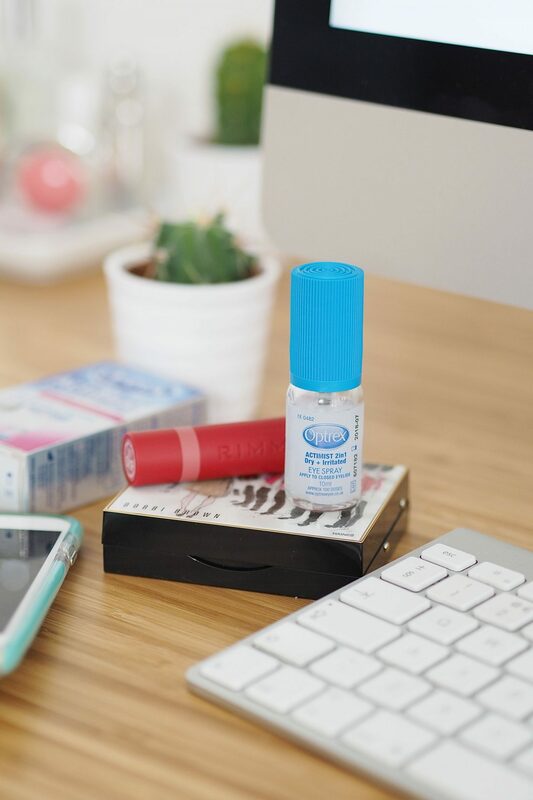 The Optrex ActiMist 2in1 Eye Spray gives all the soothing and refreshing benefits of a traditional eye drop – it helps refresh and revive eyed by helping to repair the eye’s natural moisture barrier to reduce moisture loss. But the best bit being you can skip the awkward dropping into your eye and just spray on to closed eyes. Yes, CLOSED eyes. It’s like magic really… how does it do it’s thing?! But, in a similar way to a spritz of a facial mist works wonders for refreshing your face and make-up through the day – these clever ActiMist eye sprays really do bring a comfort boost. These are my preferred way for ‘on the go’ type refreshment. Also known as having sore eyes but still having a to-do list and deadlines ahead of me. I need something fast, effective and convenient. Oh, and if you’re wondering if ruins make-up, it doesn’t at all. Not even a smudge of mascara. Optrex also has an altogether more luxe and pampering option to soothe tired eyes. The new Optrex Warming Eye Mask. These are pretty special and ideal for more of an indulgent option. They are single use and also very clever as they are single use and self-heat, so no need to pop in a microwave or anything to get that warming soothing effect. Ii first tried this on Friday when a combination of a long week and the onset of a cold had me feeling pretty ropey. This felt dreamy. A soft, comfortable mask with a warming feeling across the whole eye area was so soothing. Just the warming sensation itself was just what I needed. They have a special ‘microsteam technology’ that means it has a sort of hydrating feeling for the eyes too. It takes a couple of minutes for the mask to heat up and it’s recommended that you wear it for between 10 and 20 minutes. I love that these are so ideal for travel. A single sachet – so easy for carry on. Just imagine how soothing this would be after the dry air of a long haul flight? Perfect. Or just as I used it when I was in need of some TLC as I was feeling a bit sorry for myself! It worked a trick. Your eyes are pretty important – they’re the only pair you have so well worth taking good care of them. These are wonderful products! I have been using Optrex Warming Eye Mask for years and love it! After working on computer whole day my eyes feels so tired. These masks is so soothing, my eye feel refreshed after using this mask.